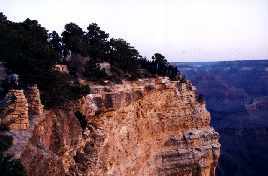 This time, we decided to check out the sunrise at Yavapai Point. It was another beautiful day and another beautiful sunrise. 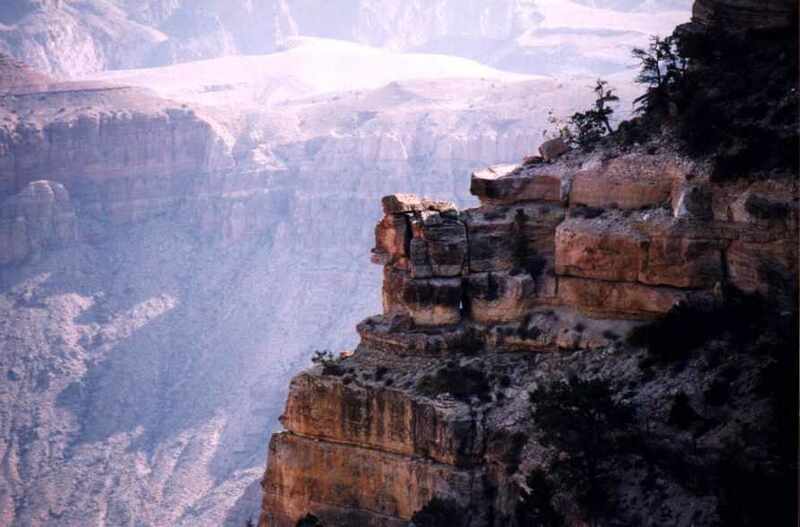 Since we had the Hermit's Rest Tour scheduled for late afternoon, we decided to follow the route of the previous day's Desert View Tour and take out time to see the things we might have missed during the Tour. Our first stop was at Mather Point, where we set up the tripod and took a Panoramic series of photographs. 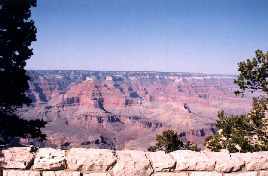 Mather Point also gave us the only view of Phantom Ranch, which is where people who ride the mules down into the Canyon spend the night. 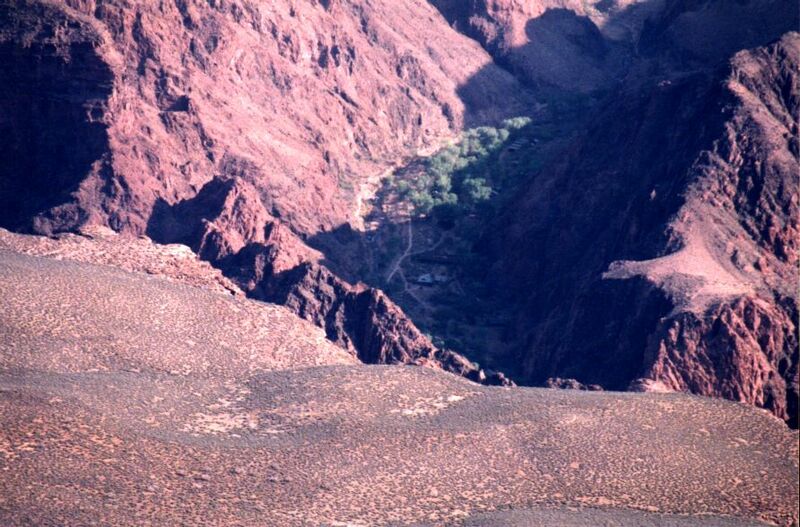 Phantom Ranch is located on the far side of the Colorado River, and the trail to get there is over 7 miles long. This photo was taken at 300mm zoom. At a turnout on the road West of Mather Point, we saw an interesting rock formation that looked a little like a face in the rock. 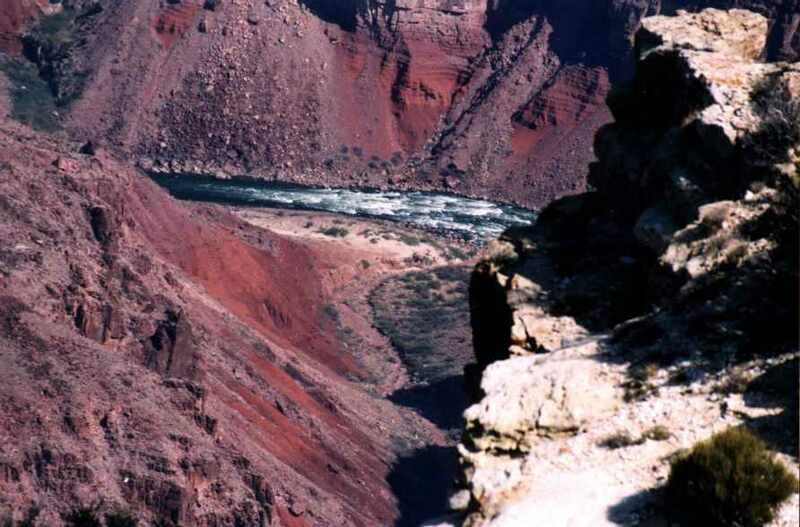 Then on to Grandview, where there is a good view of some of the rapids on the Colorado River. 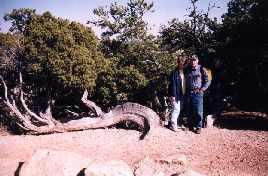 We then decided to get over to the West Rim, where we were to meet our Hermits Rest Tour. We decided, still having plenty of time, to walk out a couple of miles then ride the bus back to meet our tour. 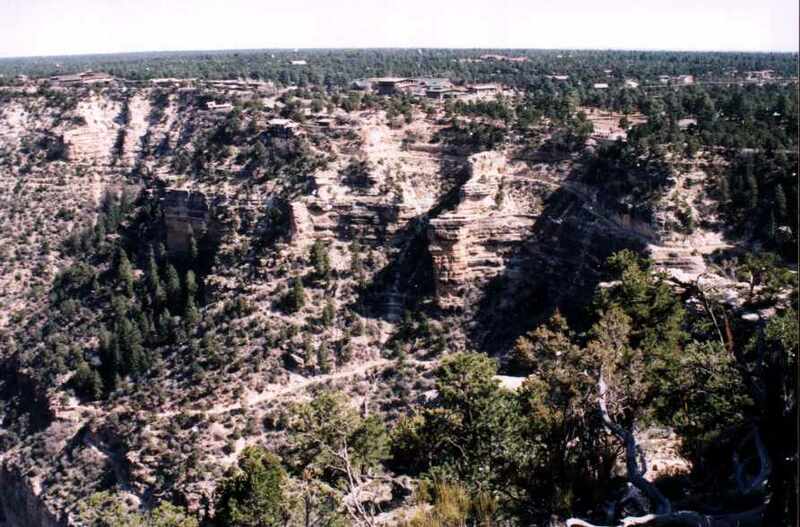 There were excellent views East to El Tovar Lodge and the Village. 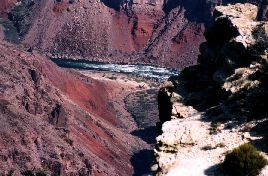 This photo also shows some of the Bright Angel Trail winding its way down the Canyon wall. One of the stops on the West Rim (and the one we met the bus at) is Powell Point. 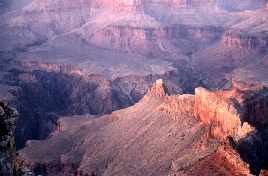 Powell led the first documented mapping expidition through the Grand Canyon down the Colorado River. 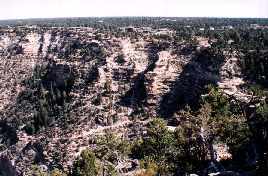 A monument was erected to Powell here. 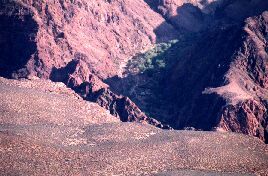 One of the interesting things the guide pointed out to us on the Hermits Rest Tour is the number "7" in the Vishnu Schyst formations visible from Mohave Point. 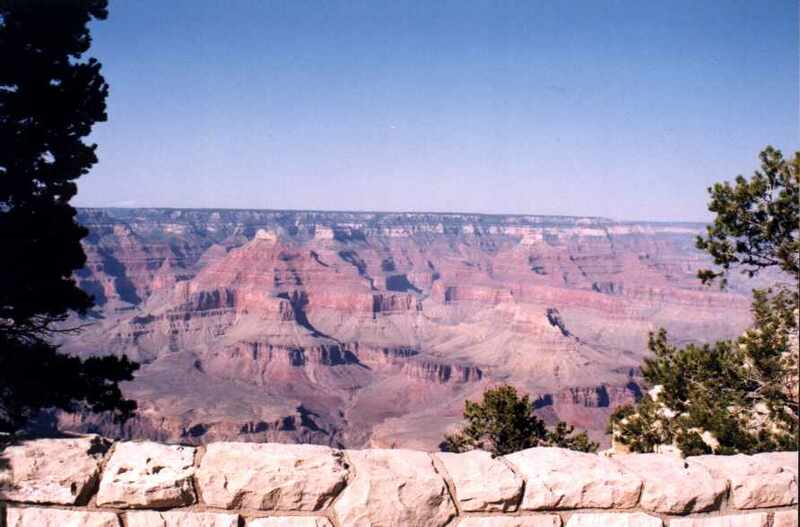 Since the Grand Canyon is one of the Seven Natural Wonders of the world, this seemed appropriate. See it (it is almost exactly in the center of the photo)? The sunset at Mojave Point was spectacular. However, we decided to just enjoy this one for itself and skip the photos. 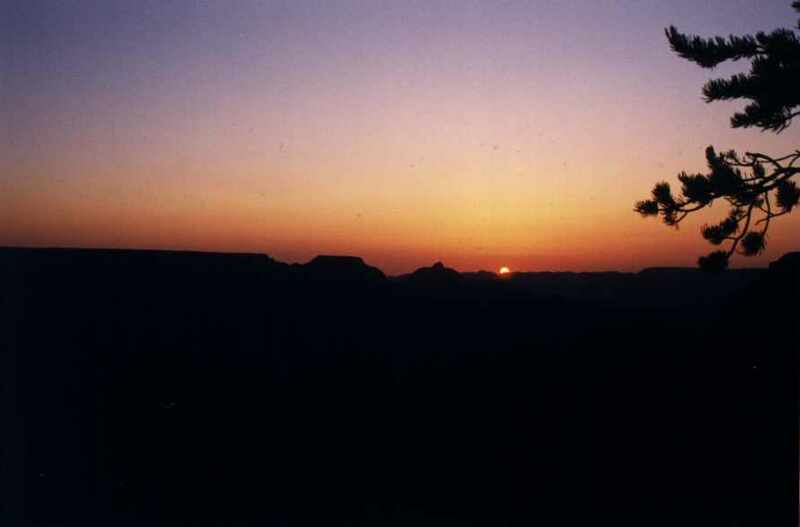 If you ever go to the Canyon, be sure and catch a sunset at Mojave. It is indescribably beautiful. We attempted to get a table at the Arizona Steakhouse, which is one of the two really great restaurants at the Grand Canyon. Upon hearing of the 2 1/2 hour wait, however, we decided to go back and eat at the cafeteria at the Yavapai Lodge Center, and try again Tuesday.